How to train your dog to voluntarily wear a muzzle and love it! Click on the image for Q & A and more muzzle training tips from The Muzzle Up! Project. Start by purchasing a properly fitting muzzle. 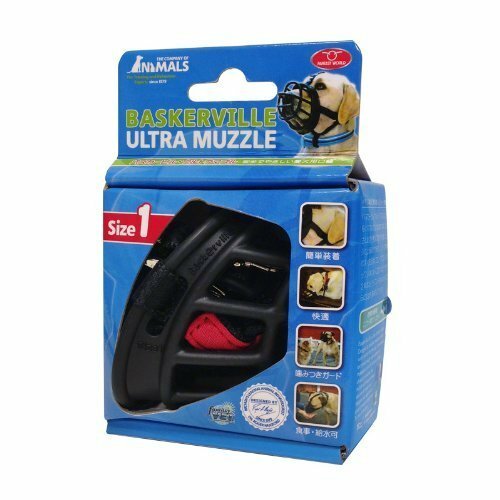 Baskerville and JAFCO are both wonderful brands of basket muzzles; the material is relatively soft and the basket style allows your dog to eat treats, drink water, pant (which prevents your dog from over heating), and even play with certain toys like tennis balls – all while preventing your dog from being able to bite. Basket style muzzles are a must for dogs who will need to wear the muzzle for longer than a couple minutes. Your dog should never look like this during training. You can see the whites of her eyes, her tongue is sticking out, her ears are back, her body tense, and head turned to the side. Learn more about body language here! I do NOT recommend nylon, cloth or leather muzzles like the one pictured to the right because they close the mouth and prevent your dog from panting, drinking, and taking treats. They can be scary and uncomfortable to wear and can cause your dog to become dangerously overheated if worn for more than a few minutes. The dog pictured above is very worried about wearing that muzzle! Check out the step by step instructions below! Click this link for more fun muzzle training and muzzle decorating ideas from The Muzzle Up! Project. If your dog has had to wear a muzzle for a vet exam in the past, there is a good chance he won’t be very fond of wearing one now. Be sure to take the following steps slowly and be patient. The goal is to help your dog understand that the muzzle is not something that predicts scary or painful things, but instead something that predicts treats and fun. This process might take a couple of weeks or several months, depending on your dog’s previous association with the muzzle and how often you practice together. 1. Place your muzzle on the ground and toss a bunch of small high value aka really yummy (chicken, cheese) treats around it. Leave the room and allow your dog to explore the muzzle on his own terms. You can also smear treats (think peanut butter, squeeze cheese, or baby food) into the inside of the muzzle. Once your dog is comfortable eating treats from inside muzzle with you in the room watching, try moving on to step 2. 2. Hold the muzzle in your hand and toss your dog a tasty treat for approaching you with it. Once he is regularly approaching you, start only rewarding him for closer and closer approaches. 3. Next start rewarding your dog only when he touches the muzzle with his nose. You can encourage this behavior by smearing peanut butter or squeeze cheese in the muzzle. 4. You will then work towards only rewarding your dog for placing his nose into the muzzle. Eventually you can work towards teaching your dog to hold his nose in the muzzle for longer and longer periods of time. 5. Now that your dog has learned to put his nose into the muzzle voluntarily for several seconds at a time, start touching the straps but not moving them. Next you can slowly begin moving the straps up and around his neck and eventually over his head. 6. If your dog doesn’t back up, freeze, or walk away when you move the straps over his head, you can move on to buckling them for short periods of time. Unbuckle the muzzle before your dog becomes too worried about it. If he starts to try and paw it off, distract him with a high value treat and take off the muzzle once he has calmed down. If he is truly panicked you may need to unbuckle it immediately and go back a few steps. 7. Finally, you can buckle the muzzle and feed your dog super tasty treats or feed him his dinner with it on. 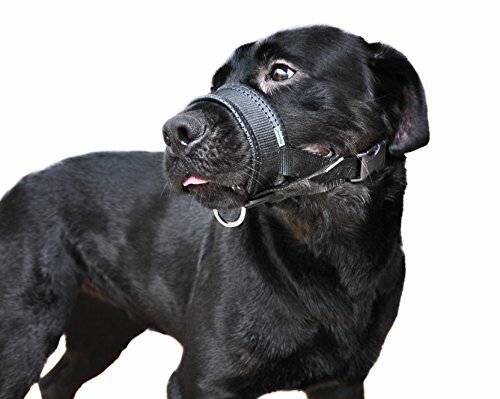 Once he is comfortable wearing the muzzle around the house for 15 minutes at a time, you are ready to use it for situations where it has been needed in the past. Keep up with the basket muzzle training and play – you don’t want your dog to only associate it with the situation in which he needs to wear it. If your dog has needed a muzzle during vet exams in the past, there is a good chance he would benefit from some calming drugs and behavior modification before his next appointment. Talk to a fear free or low-stress certified veterinarian or schedule an appointment for an in-home behavior consult. Check out the video below for troubleshooting tips from The Muzzle Up! Project.